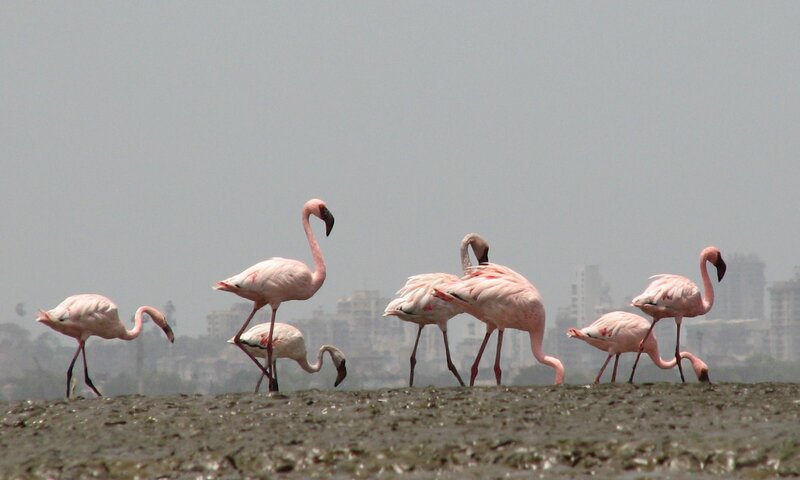 There are a total of six species of the flamingos, out of which two the Lesser Flamingo [Phoeniconaias minor] and the Greater Flamingo [Phoenicopterus roseus] come to India. 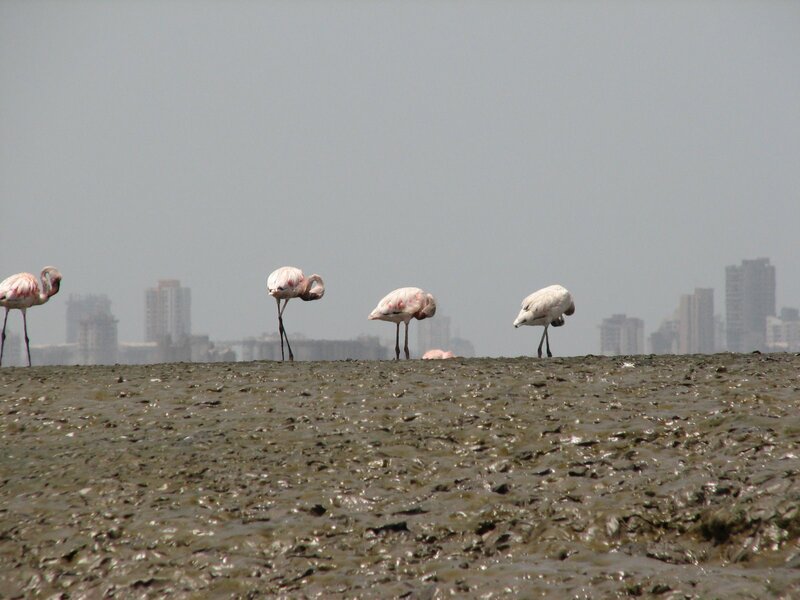 In Mumbai the area near Sewri [शिवडी] mudflats form the Flamingo habitat zone. 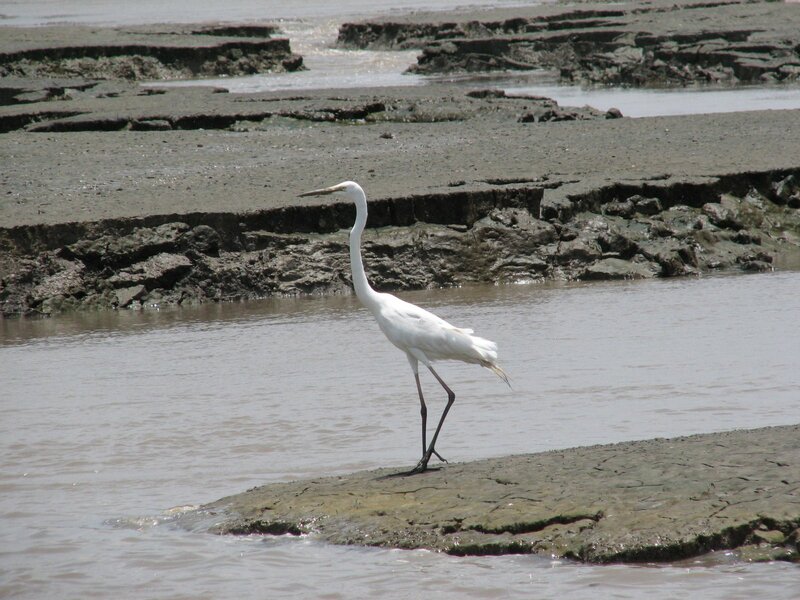 The mudflats and mangroves here at Sewri accumulate organic richness to draw lots of avians to this region. 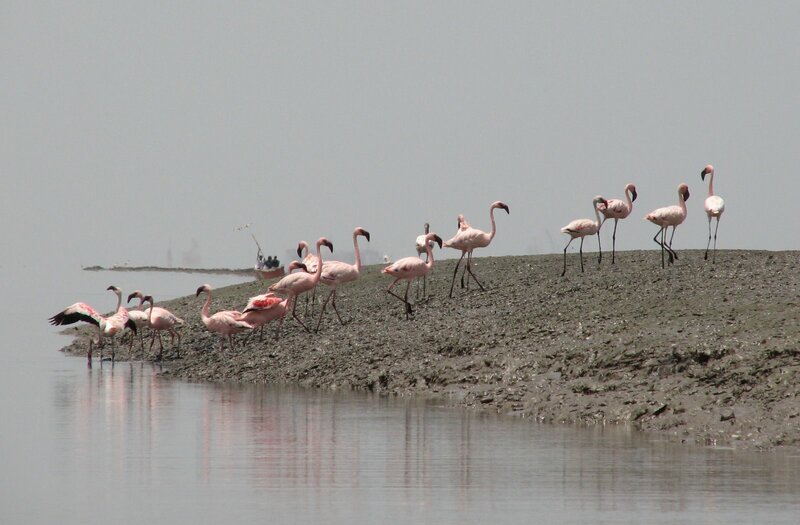 The Flamingos can be seen here from mid-October to May. 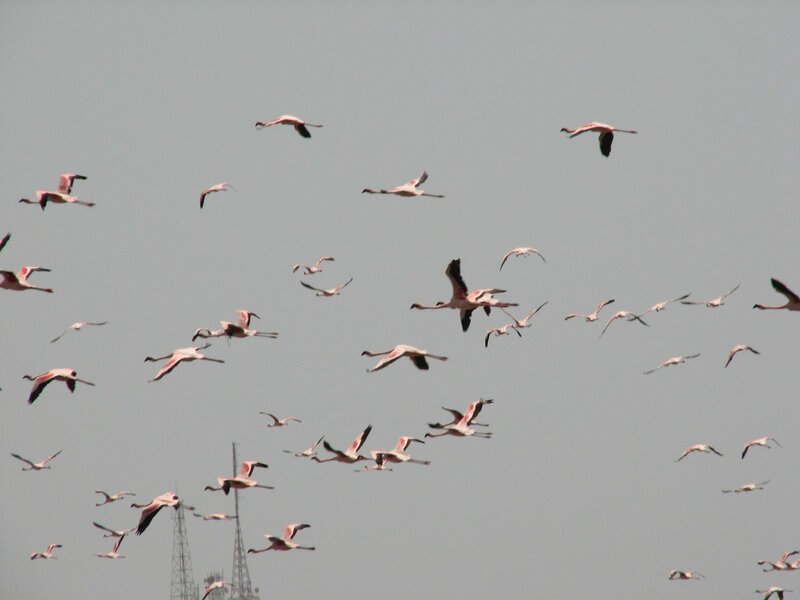 The Lesser Flamingos are more abundant than the greater ones with numbers reaching and estimated ten to fifteen thousand. 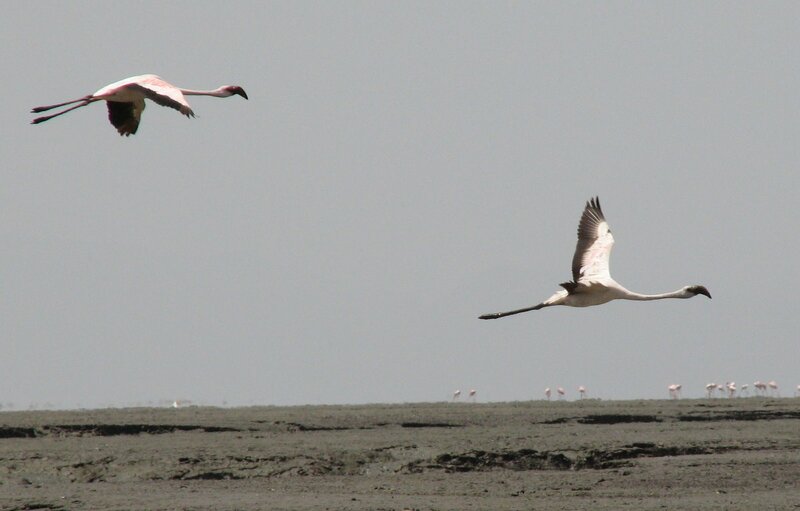 More information about the flamingos can be seen at the Wiki site. 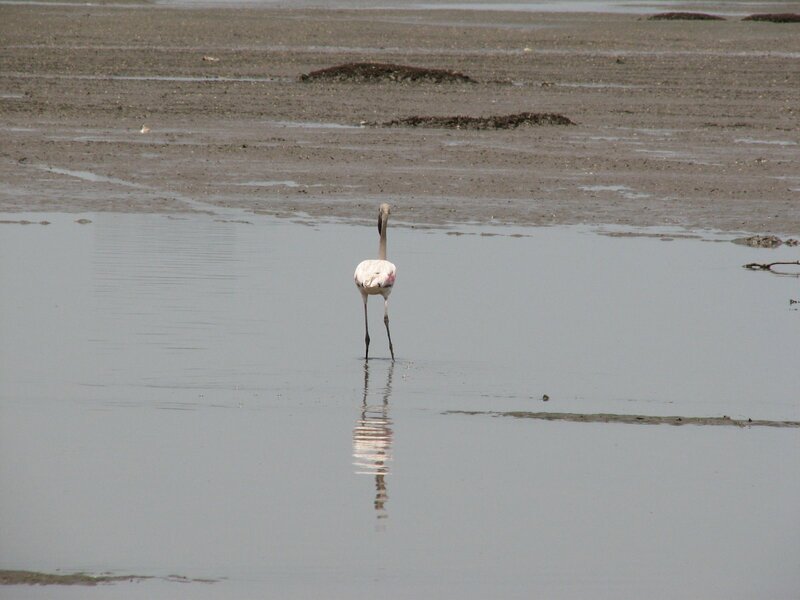 Last year me and Ritesh had visited the Sewri site, but could not get a glimpse of the Flamingos as they were too far away for our eyes and instruments to see. But none the less we saw some sandpipers, ibises, kingfishers and kites et al. But no flamingos!! You can see the images of this trip below. 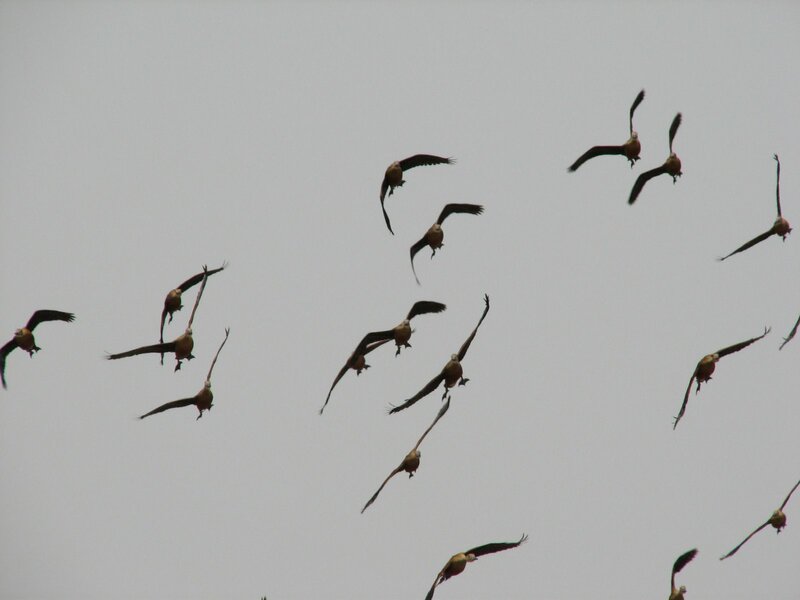 A huge flock of plowers. So this year we decided to go about it. 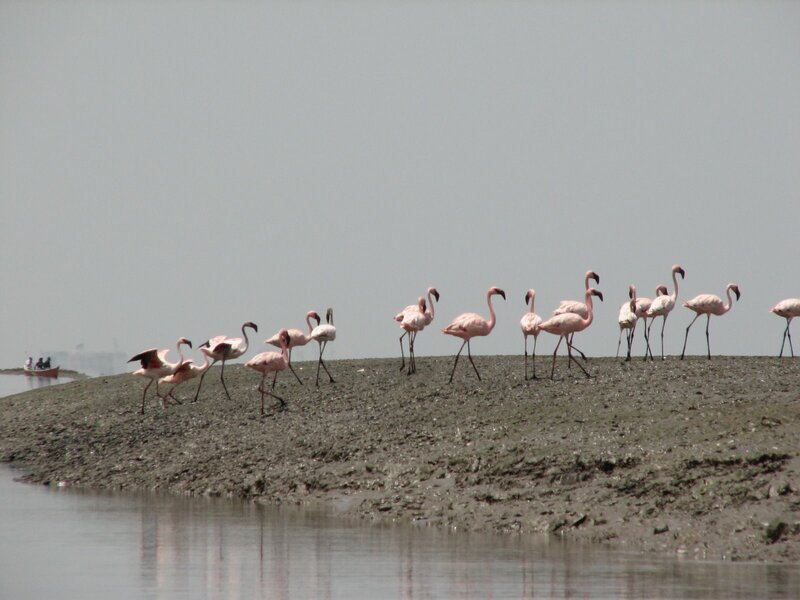 Ritesh heard that form the Mahul Village boat rides are arranged so that we can get a closer look at the flamingos. Accordingly the plan was made. There was a group of 10 from HBCSE. And others were to join us from BARC. 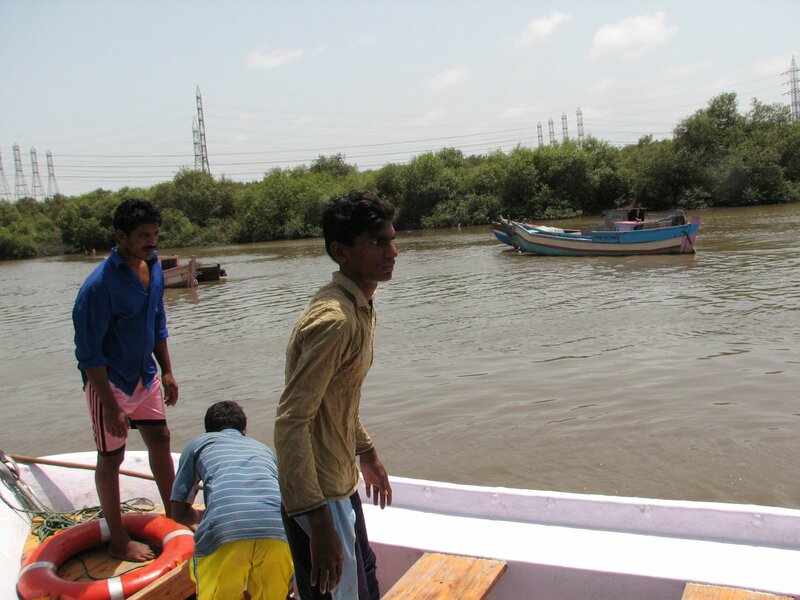 Mr. Krishna was supposed to arrange for the boats at Mahul village. Anyway we left for Mahul village in autos and an Alto at about 10:45 am. We reached there at about 11:15 am. The auto fare was about Rs. 50. At Mahul village one has to take a turn from the main road to the jetty. Another option to go to Mahul village form HBCSE is to take the Best Bus No. 364 which takes you to Mahul Village and back, via Govandi. The road to the jetty goes through the Mahul village, which is largely a fishing community. On the road to the jetty and at the jetty itself there were posters advertising the Flamingo rides. So we finally reached the jetty and the boat which would take us there was already waiting. 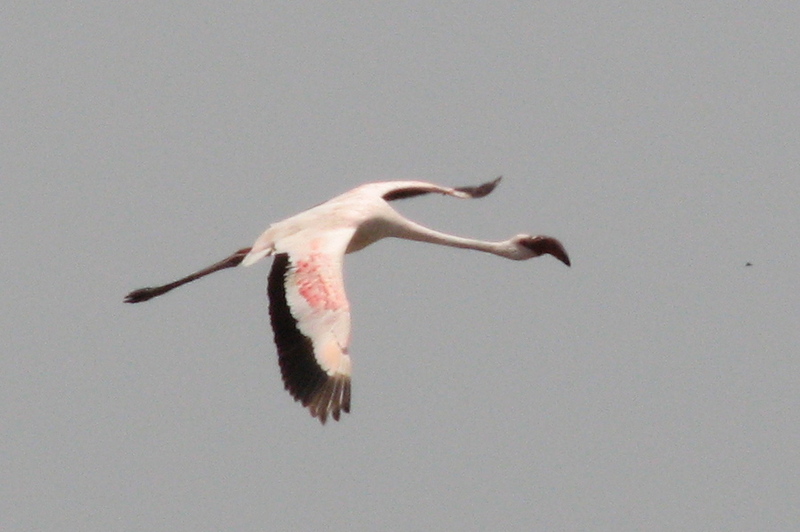 In case if any of people with me have not noticed the color of the boat was [Flamingo?] pink, and of course the name of the boat was Flamingo. See the picture below. 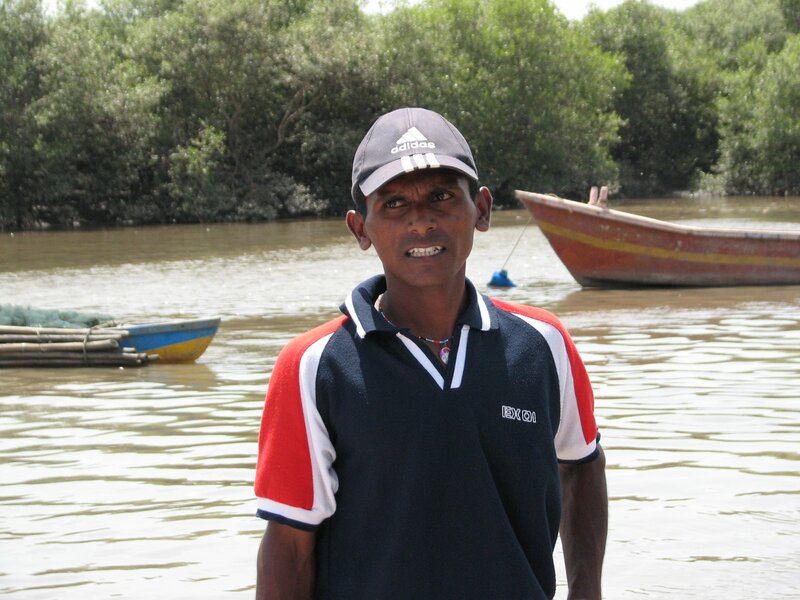 The two Koli brothers Shashikant and Chandrakant were the Captians of the boat. 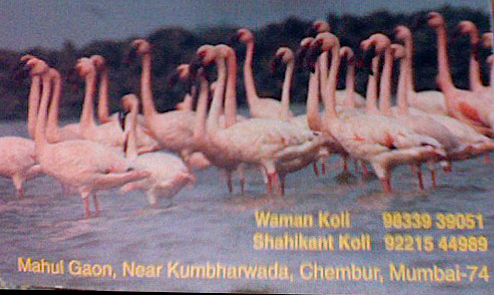 They can be contacted on the phone numbers on their visiting card given below to arrange for a ride to watch the Flamingos. They can also arrange for the ride to the Elephanta Island. The first mate Chandrakant Koli [चंद्रकांत कोळी]. 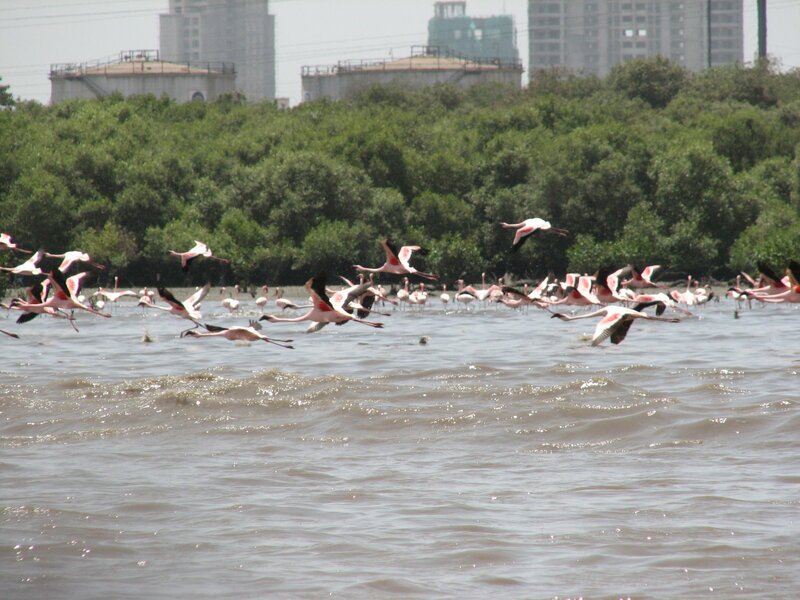 The area of Mahul jetty presents us with a combination of nature and urbanisation at the same time. 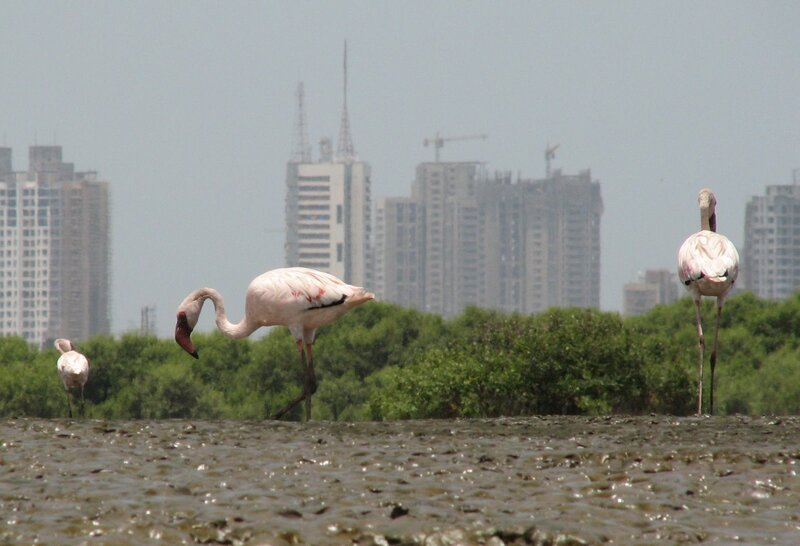 Along the ground you can see lush green mangroves and just beyond them endless line of factories and other industries, along with power transmission cables form the Tata Power Station. 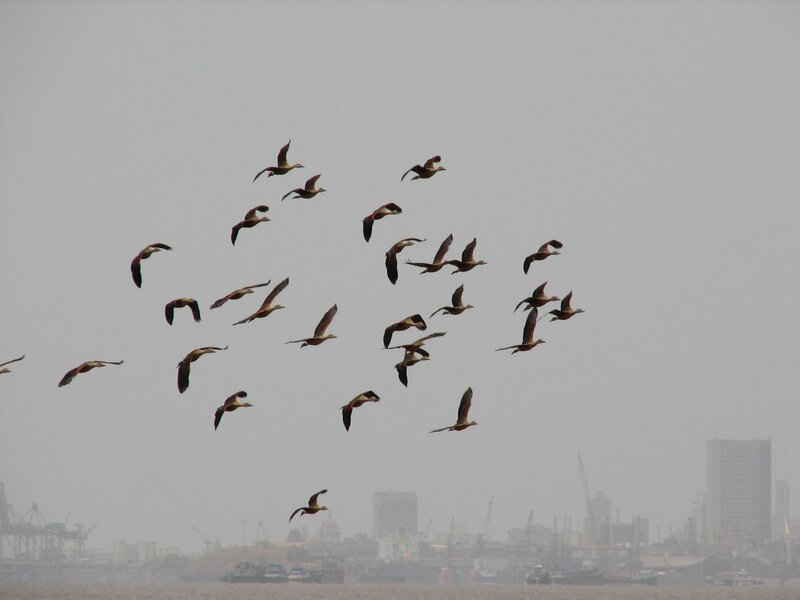 Kudos to the Port authorities who have till date kept the area still habitable to the migratory avians who flock here every year. We alighted the boat and the journey began, with paddles first then the petrol engine of Yamaha make. 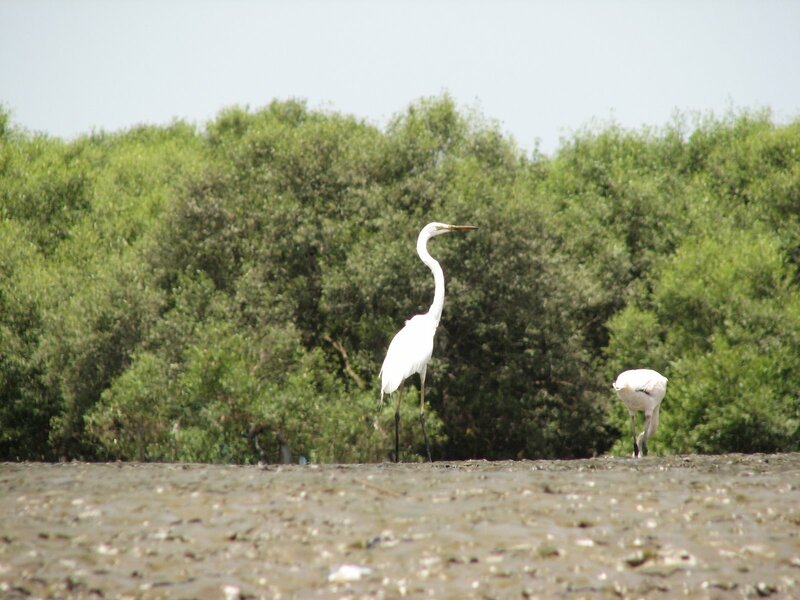 Out of the two Chandrakant had quite good knowledge of the bird species in the area, he told us that he had referred to Salim Ali’s book for the same. He could identify all of the bird species that we saw. Though not formally educated in Zoology his knowledge about the same was amazing. When we went out of the channel from which the Mahul jetty emerges, the tide was still low and we could actually see the mudflats. The water is only about 3-4 feet deep here. 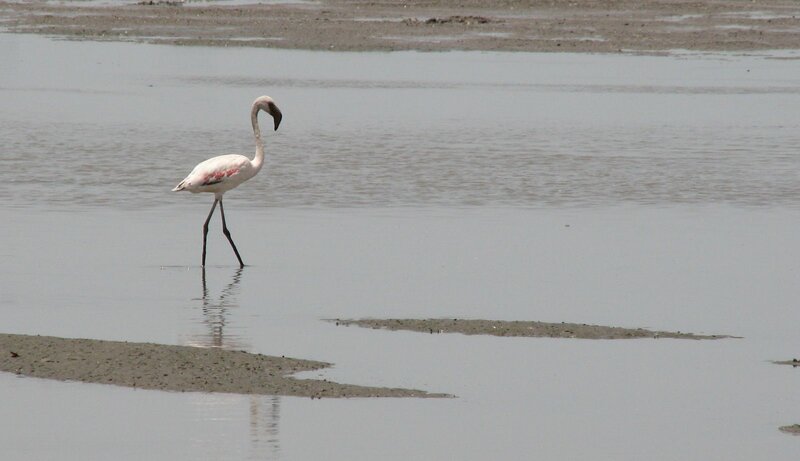 We saw our first view of the Flamingos here. Refer to the map below drawn form Wikimapia image, to see how our journey went. In the lower right hand corner the scale of the map is provided. 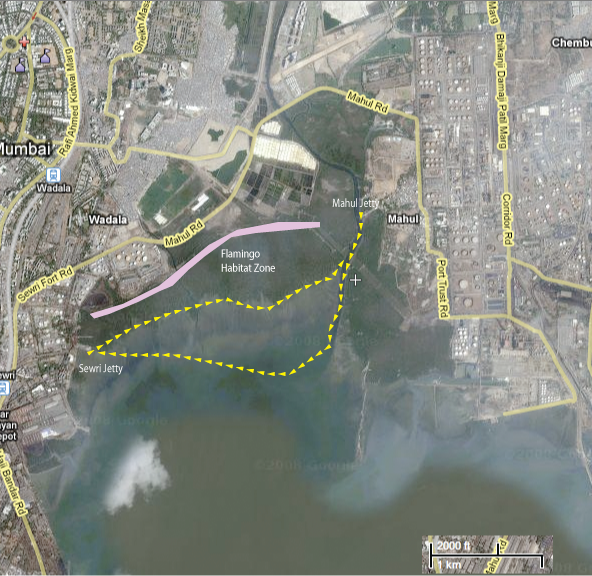 The are in pink denotes the Flamingo habitat zone along the mangroves and mudflats. 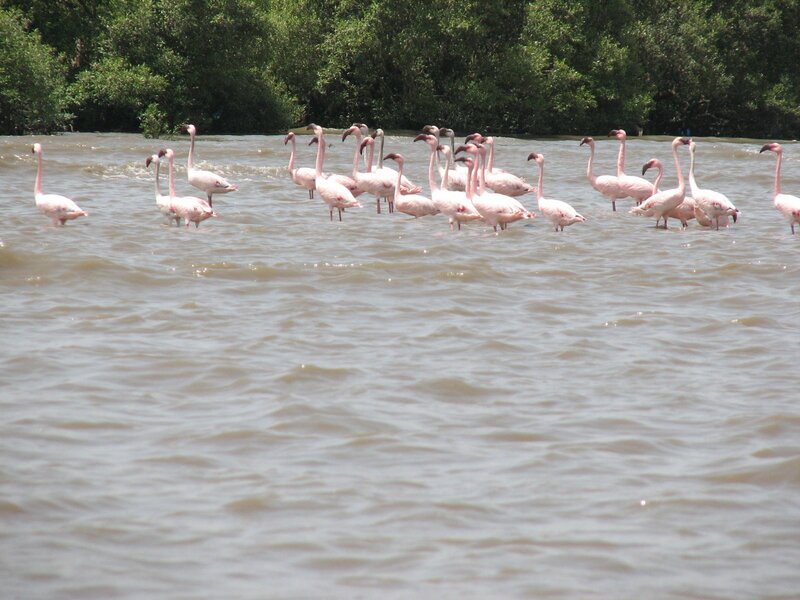 As we went by we saw numerous Flamingos who shied away as we went near them. Some of the best shots I took were from this region. The return journey was not that rewarding in terms of the closeness. A more close up one. 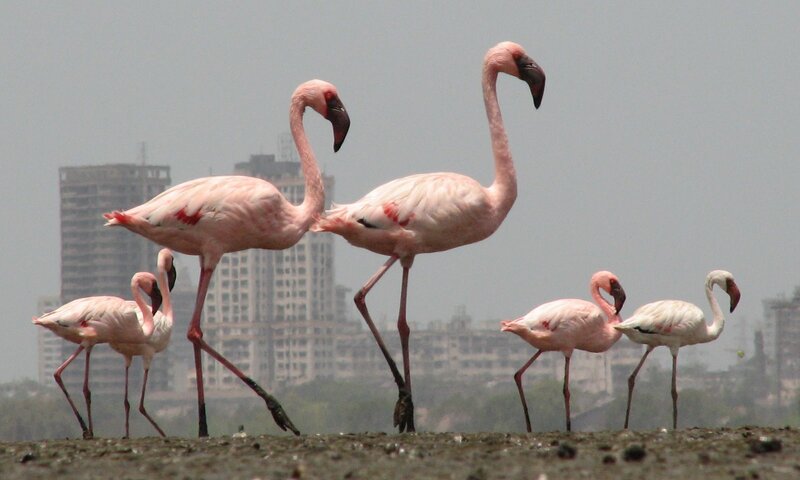 It was a wonderful sight, rows of Flamingos standing on the mudflats, against the backdrop of the South Mumbai skyscrapers. Where else can such a scene be present? White Ibis Threskiornis aethiopica (Latham). 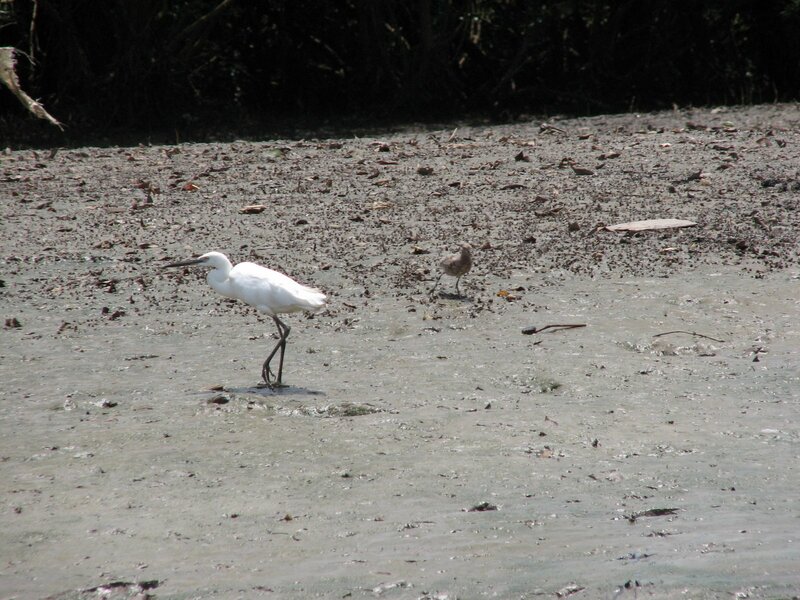 Along with the Flamingos other waders such as Ibises and Egrets were found to be peacefully having their share of the algae in the mudflats. 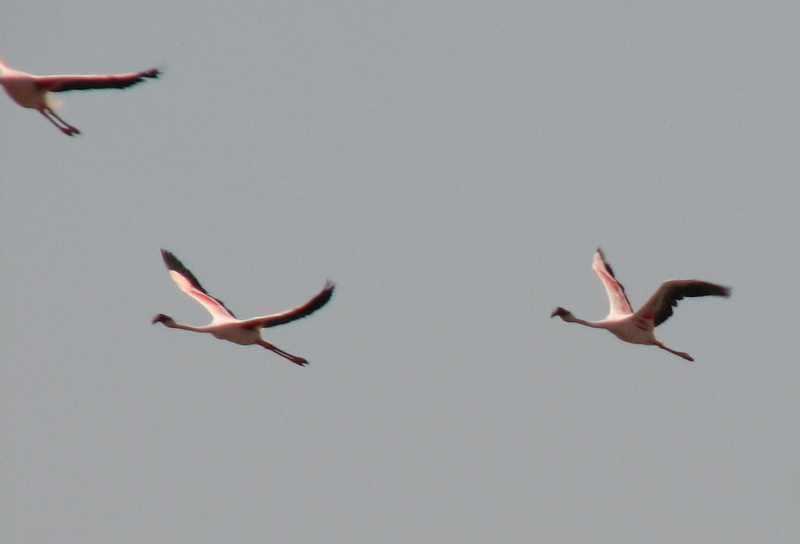 The Flamingos in flight are a wonderful sight to see. 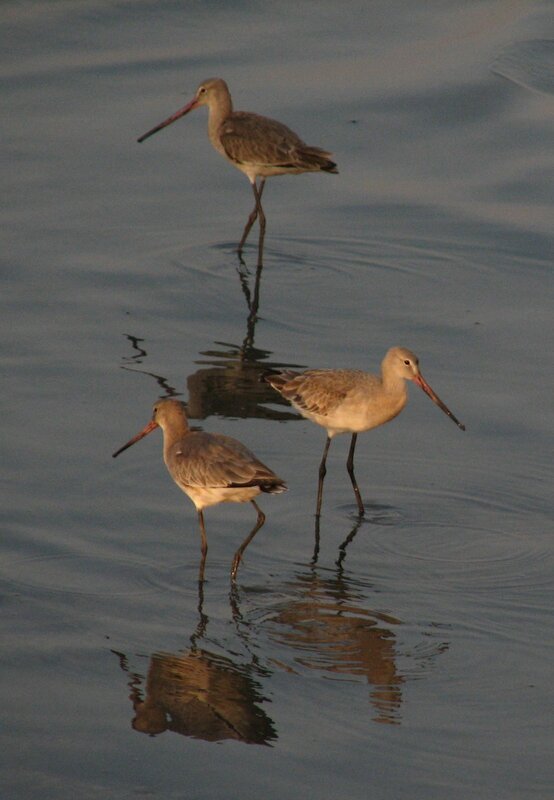 Also they make a sort of low humming sound, which is more like a sound of drums beating far away if I can remember it correctly. We had to go through a long route as we had to follow the water channel which was deep enough to take our boat. During the ride I enquired about the cost of the boat. The cost they said was about Rs. 3 lakhs. The motor engine which was Yamaha made costed around Rs. 2 lakhs and the rest of the boat body which is made of fibre costed around Rs. 1 lakh. So this is an expensive toy to have ;)… So my dreams of having a small boat in the near future are all drowned. 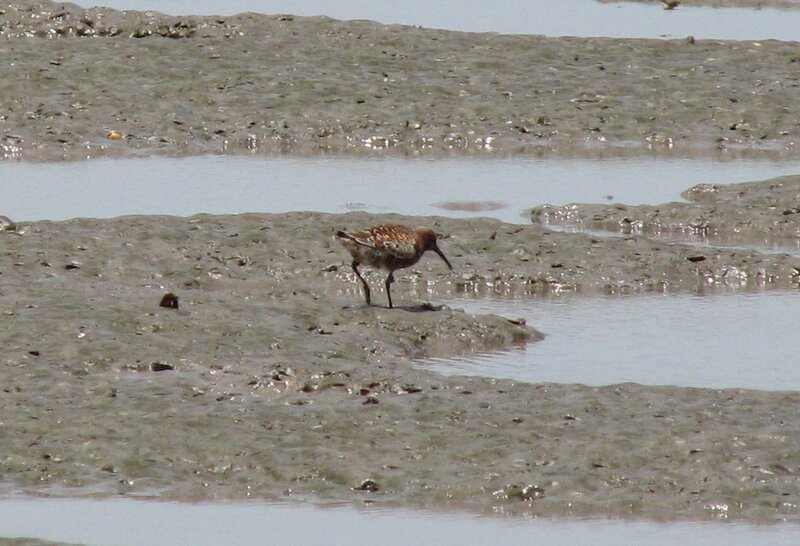 Anyways we were sighting different smaller birds who were busy in finding some food in the mud which was exposed due to the low tide. On our left hand side we could see the Tata Power Plant, which is said to have constructed a bund, where there was none, this is supposedly affecting the ecosystem of the area. Further left, we could see the Elephanta and the Butcher islands. If you make a trip to the Elepahnta islands from here, it will be very easy as they are very near. The tide was rising and we could feel the force of water rushing in on our little boat. The areas where the water was shallow were especially turbulent. And the waves were a bit high there. So it was decided that we wait in a bit deep water for some time and let the water rise a bit near the shores. When you are anchored in the water and the water is moving around you as in the case of a tide, this illusion as if the boat is also moving comes very strongly. The first time I experienced it was when I was returning to the land from Arnala [अर्नाळा] island fort. And believe me that this illusion can be really strong. We could see some fishes flying form water, and making multiple skips on the water surface before going back in water. Far away we could see a line of pink which got unusually bright at one particular spot. 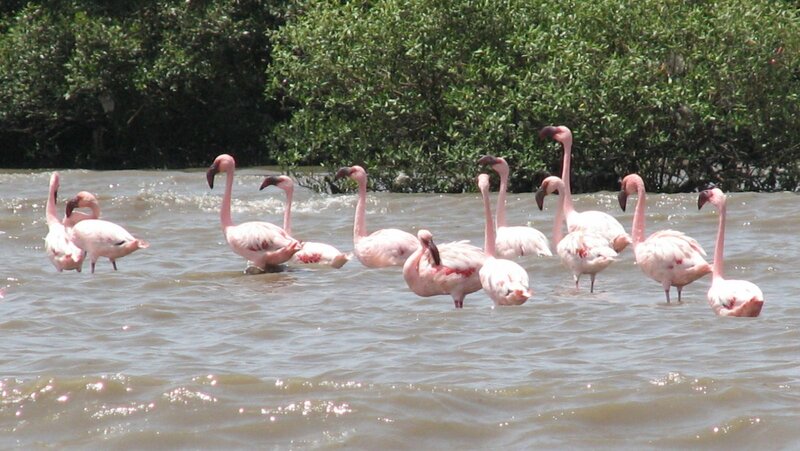 I think there was a great concentration of Flamingos at this spot. 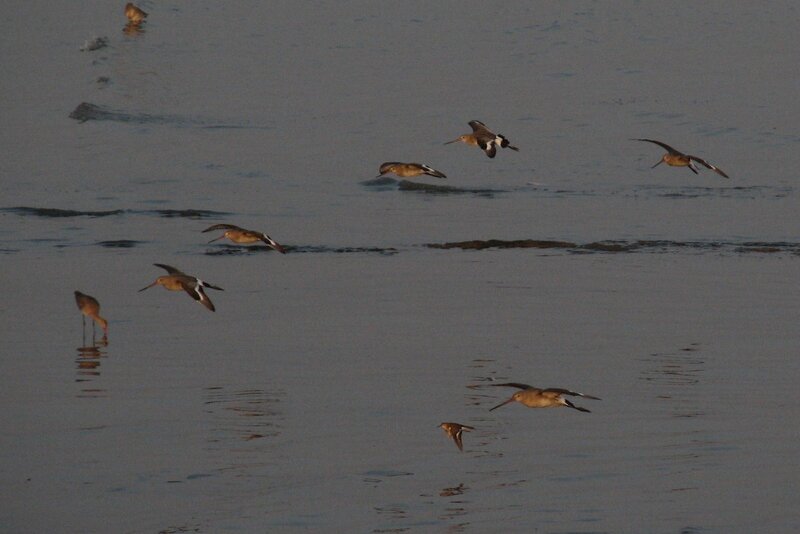 During this we saw a flock of whistling ducks or teals, which made quite a few acrobatics before landing. But unfortunately we could not hear them whistle. 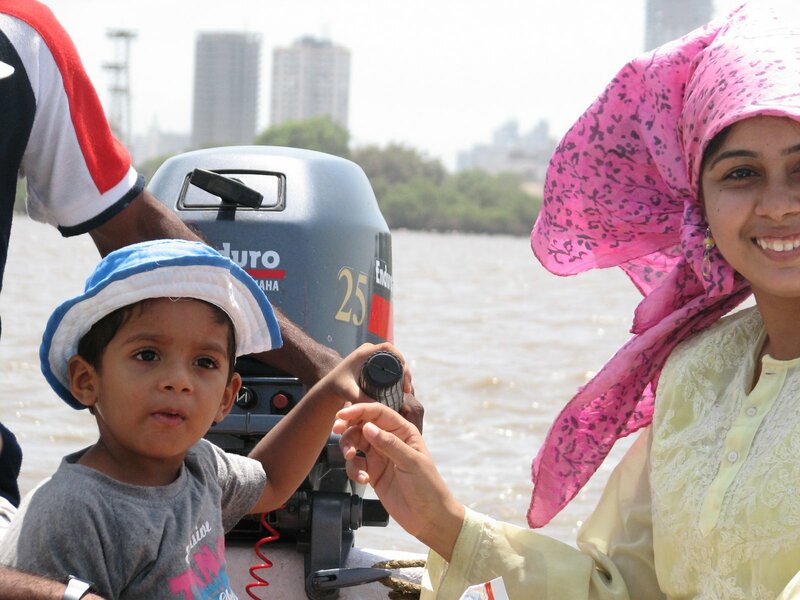 One of us wanted to alight at Sewri, so the boat was taken there. Due to rocks under water there was a bit of delay for this, but ultimately it came through. Then we began our journey towards the birds. 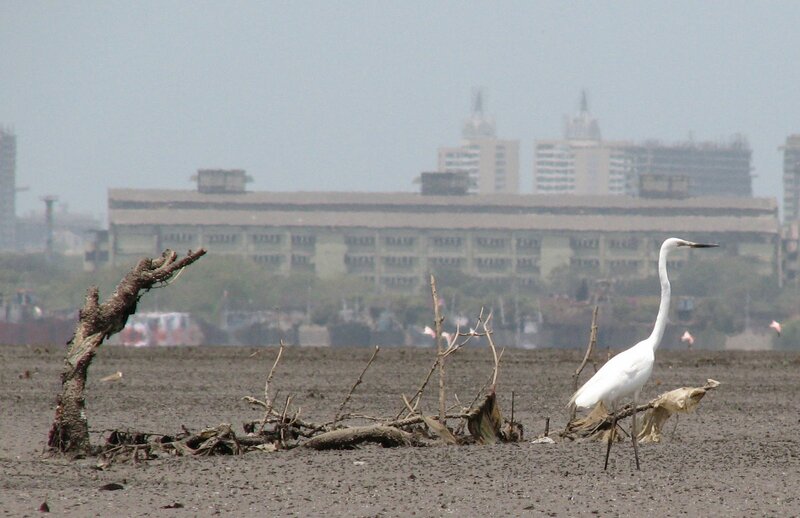 We could see the ruins of Sewri Fort on the coast, which we missed on the last visit to Sewri. This is the fort to be visited in the near future. 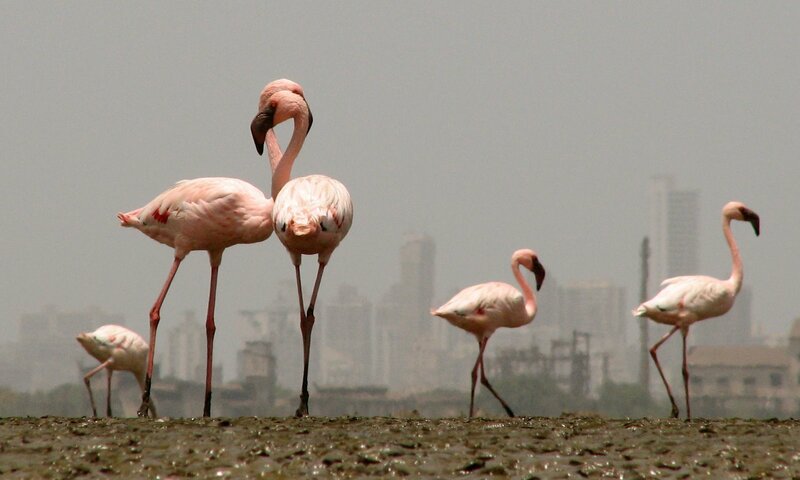 The Sewri Fort with Flamingos at the bottom. The water had quite risen, even though at the deepest it was just 3-4 feet. 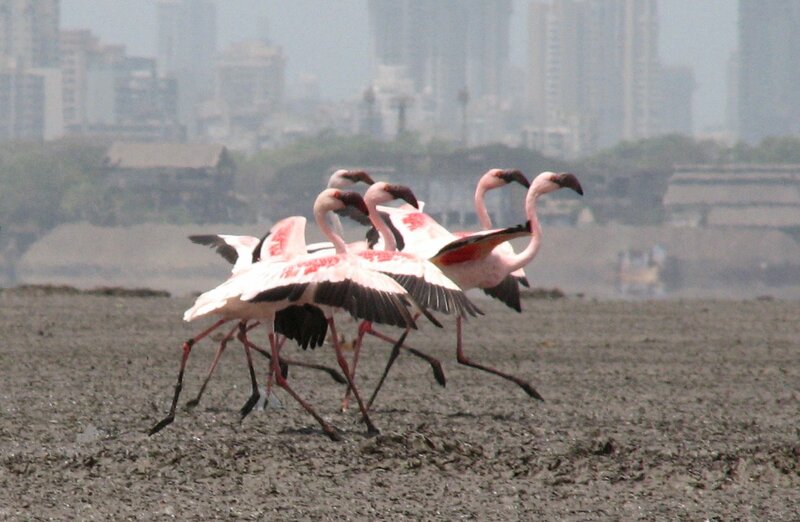 The Flamingos were now standing with their feet almost in water. This was the time for them to leave for the dry lands. They would come back here with the low tide. Meanwhile there were two people with pro-looking cameras who were in a smaller row boat, who went really close to the Flamingos. I wish I was there in that boat. Next time we take that boat instead of this bulky one so that we can get really close to the pink avians we have come to see here. But that is for the next time. 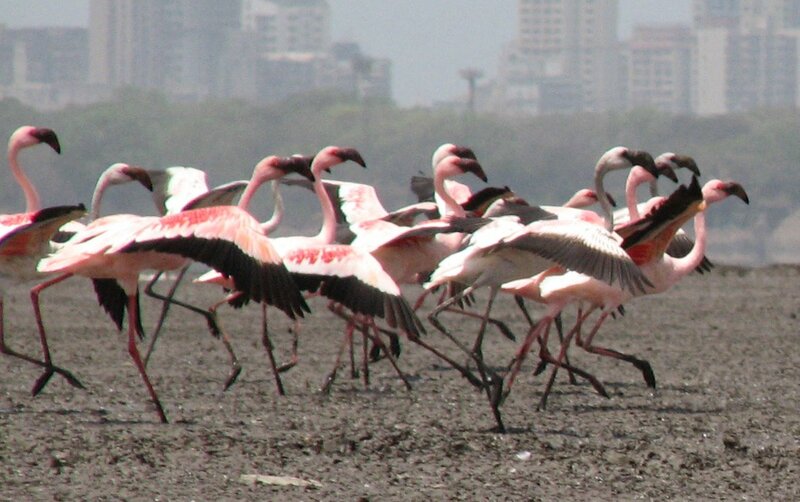 So one by one each flock of Flamingos was going to the dry lands. We went for one of last remaining ones. 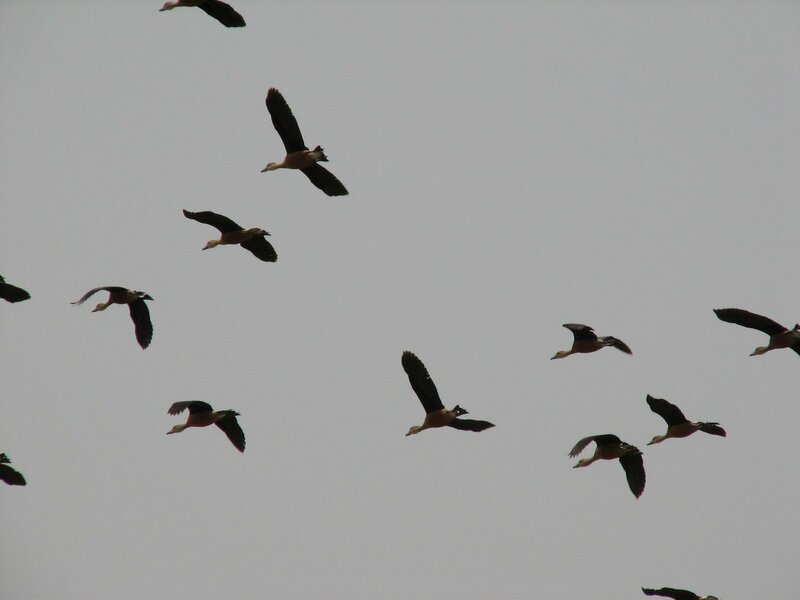 When they fly in rows they make a scene to watch. 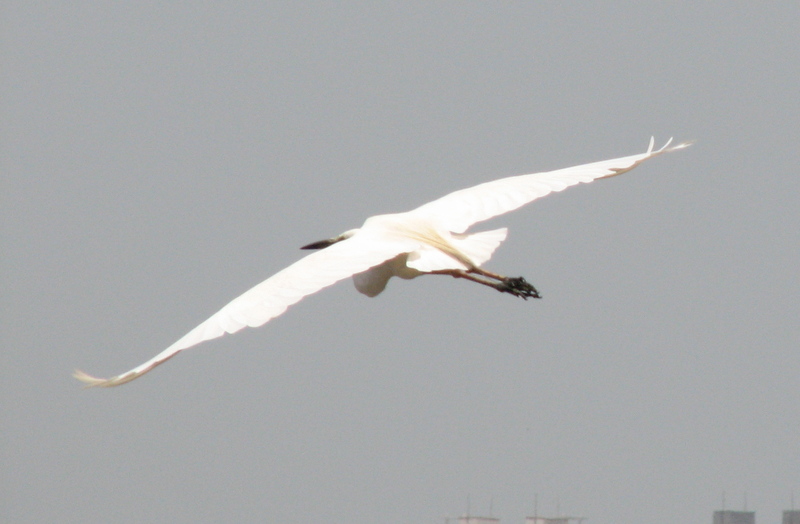 Also when they start to fly they take a sort of ‘run-up’ before they get airborne. 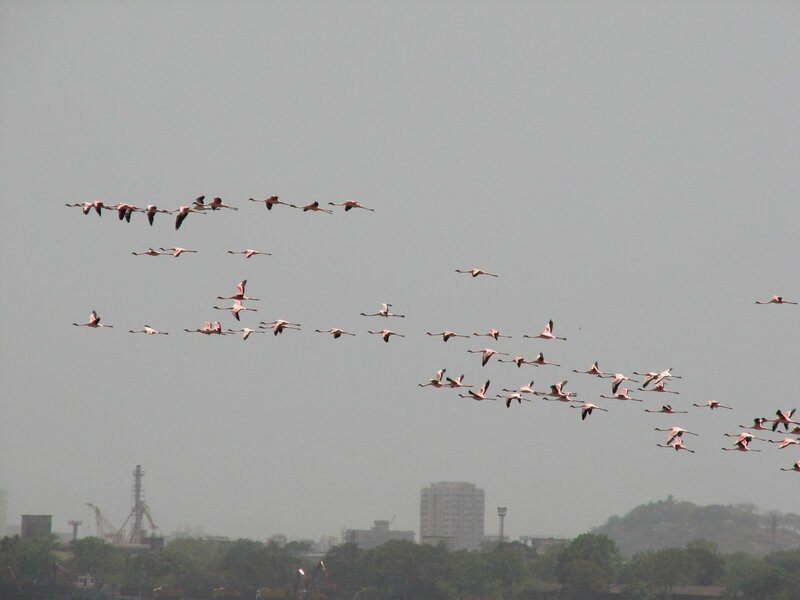 We could see all this happening in a wave like fashion, as when one of the Flamingos got off the rest of the flock followed. 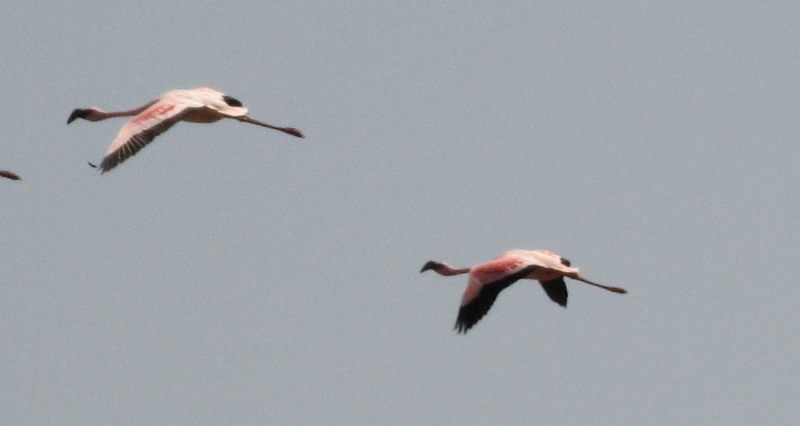 Videos of Flamingos in flight. When all were gone we left for the Mahul jetty and then back to the Centre. The return journey was much more easier as the water was now high, hence opening pathways which were not accessible initially. The total cost of the trip went to Rs. 100 per head for the ride, which was totally worth it. So you too find the road to Mahul and meet the pink avians if possible this year.!!! P.S. Which ones did we see? 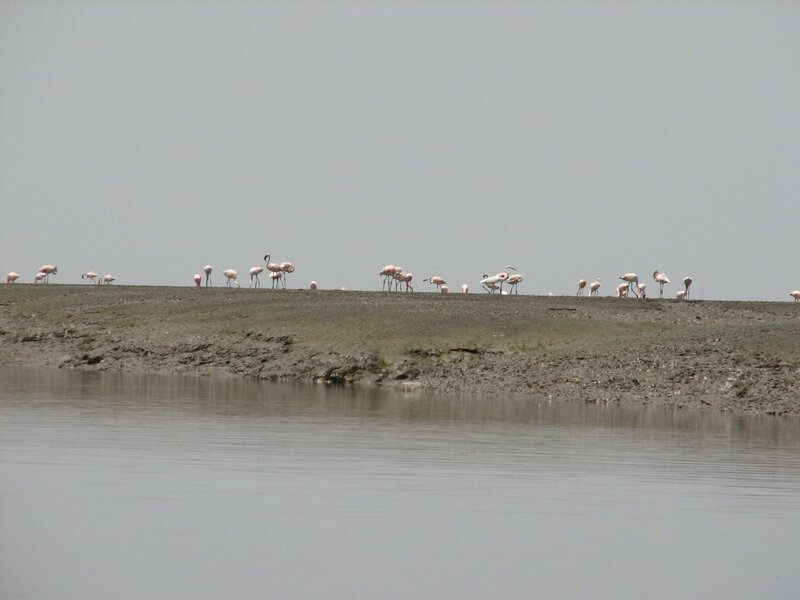 Although it was said that we only saw the Lesser Flamingo, after looking at the features of the Greater Flamingo in Salim Ali’s book, we came to a more confusion. 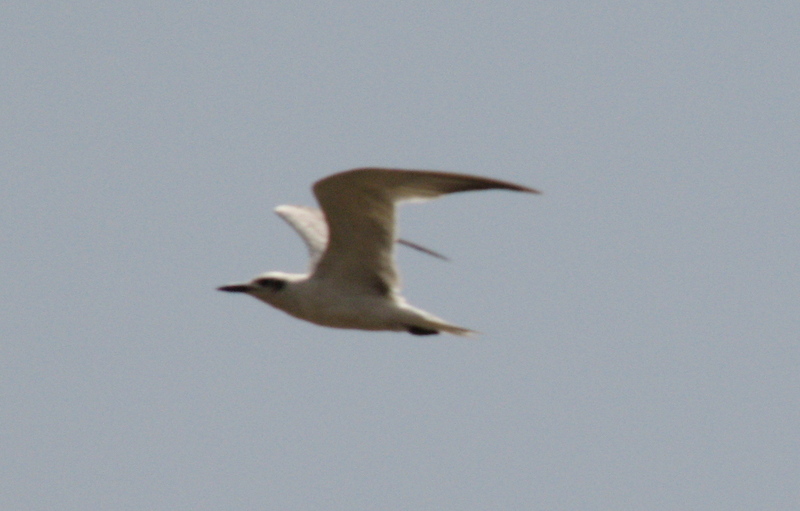 The final conclusion was that we saw both the species!! 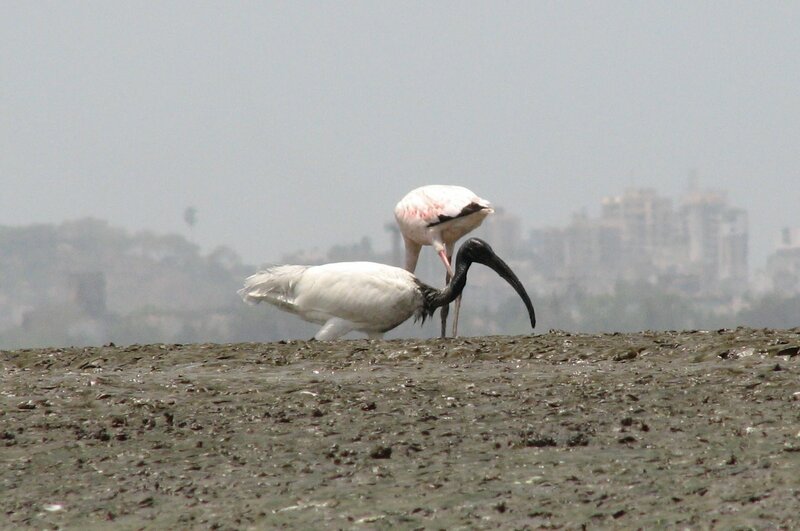 Here is what Salim Ali’s book says about the identification of two species. 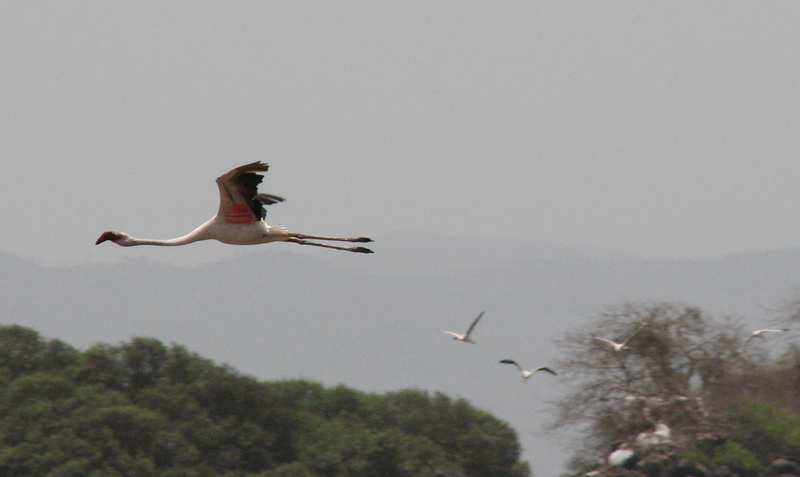 Field Characteristics: A long-necked rosy white stork-like bird, with a heavy pink bill, turned down at an angle from about half its length. Sexes alike. In flight outstretched legs and neck, and the black bordered brilliant scarlet wings are diagnostic. Field Characteristics: Upper mandible not overlapping with lower. Bill dark colored with crimson feathers around its base. 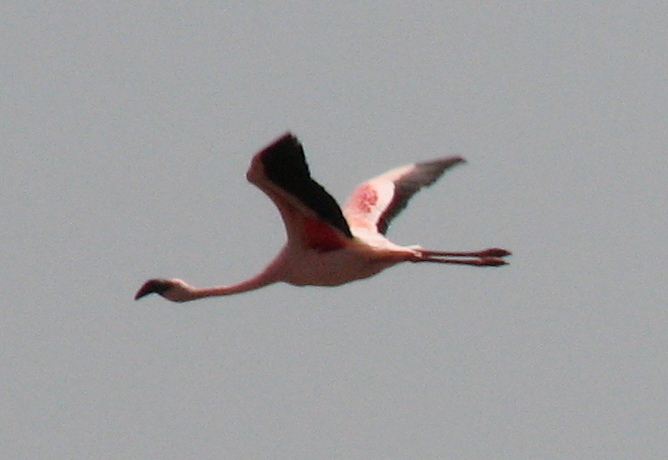 Plumage darker rose-pink than in the flamingo. Size smaller. Crimson and dark underwings, shorter trailing legs in flight diagnostic. So what do you say from the images and the sightings that we have? Me and Ritesh concluded that we saw both! 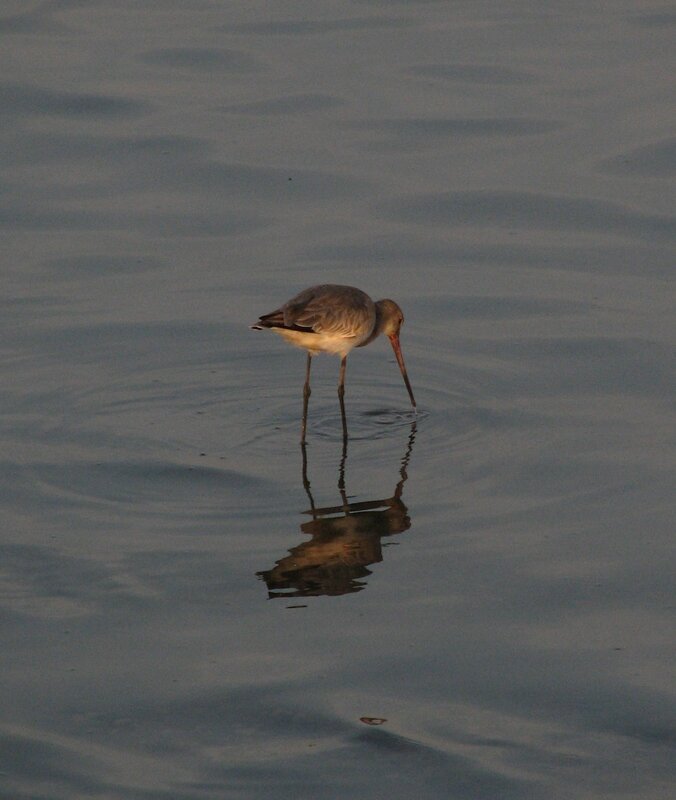 This entry was posted in avians, birds, boats, egret, flamingos, fort, ibis, mangroves, migratory, mudflats, mumbai, sandpipers, sewri, waders. Bookmark the permalink. Hey, the article really helped me. 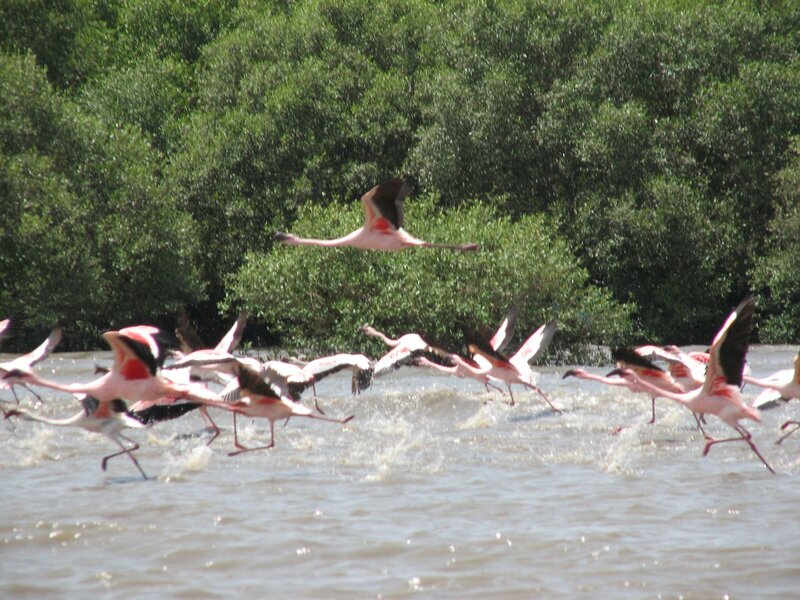 I am a photographer and as I was scouting the net to dig information to go to Sawri for a day trip Photographing the Flamingos, I happened to land on this article. Really helped me especially the Visiting card and the phone number of the Kholi boatman.Parthhoe Mithraa. Thank you. Your information, directions and images are superb. Am hoping to head there now and am so happy i saw your blog before heading there. What a find! Im glad to find this post! 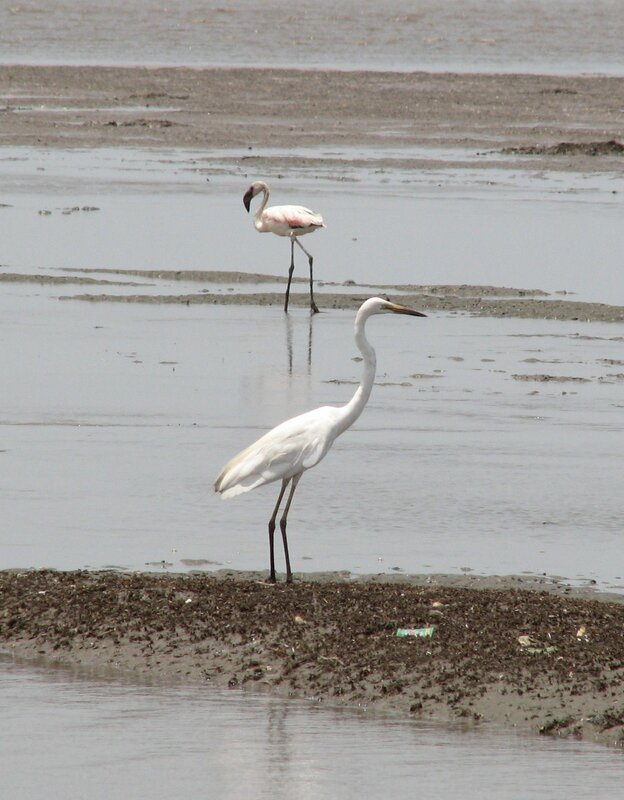 Have been enthusiastic and frantic to find a way to get an upclose look of the pink winged birds at Sewri! The elaborate account of your trip is remarkably enlightening! I hope it helps in working out a trip this year! Thanks for the contact number and amazing pictures!